Included: why in-arena music is overdone. Giannis Antetokounmpo is literally a freak. That’s what makes his nickname work, of course, but he made two key plays down the stretch of today’s series-tying Bucks win over the Celtics that really demonstrated how special he is, both physically and from a basketball IQ standpoint. Yeah, that’s…not really stoppable. Credit Al Horford for trying, I guess. That seemed like it might put the game out of reach for the Celtics, but as you might expect from a Brad Stevens team, the Celtics didn’t give up, and ended up taking a 100-99 lead. 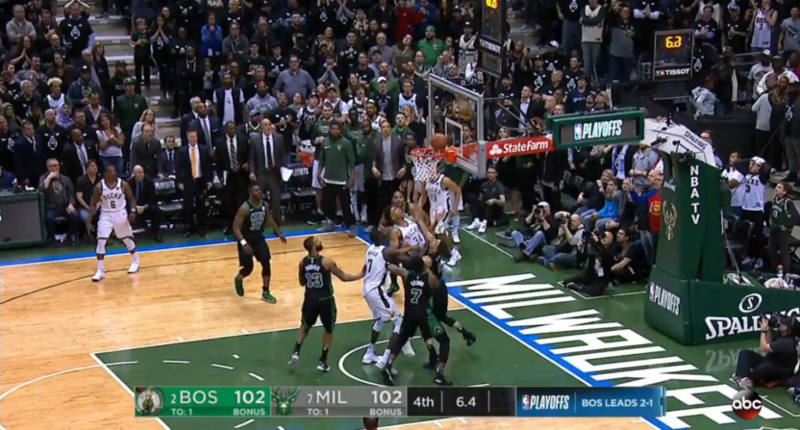 After traded baskets including a Malcolm Brogdon three, the game was tied at 102, and Milwaukee had a chance to run down the clock and try to take the lead. That’s so impressive. Giannis is still only 23, but he’s quickly cementing his place among the best in the world. (He and Anthony Davis have made the most progress towards that particular Mount Rushmore this season.) He times his tip perfectly, getting it just as the ball is about to tumble off the rim, and he’s almost impossible to box out. That makes him a weapon on big plays like this at the end of games even if he never touches the ball before the initial shot goes up. While we’re here, can we talk about one of the most underrated annoying things in the NBA? Watch that final Bucks possession again. It’s a massive game, one of the biggest in Milwaukee in recent memory, and as the clock winds down and the potential tying shot goes up, the arena is blaring the intro to an 8-year-old Kanye song. Why? The sounds of the crowd in those moments are some of the best part of sports. That’s something college basketball does get better; bands are generally better than arena songs anyway, and they can’t play during live action. Some college stadiums and arenas do also utilize recorded music, but there’s much less piped-in noise overall. And it’s not just Milwaukee; I just rewatched the end of Friday’s Pacers-Cavs game, and Bankers Life Fieldhouse also used some music and effects during live play in the final possessions. It might make sense during a random February game where the alternative is a dead stadium environment, but let the playoffs speak for themselves. And with that, the series heads back to Boston tied at 2-2. It’s been more fun than most people expected, given the Bucks aimlessness and the Celtics injury issues, and a lot of that has to do with the joy of watching Giannis continue to elevate his game, figuratively and literally.